Our traditional Fixed Dental Braces provide teeth straightening for a relatively low cost and can be used in all mild to complex cases to improve your smile and appearance. Having great teeth helps you feel good, smile more, and the world smiles back, making it a happier place. There is more of an impact than you might think. As specialist Orthodontists, we provide affordable made to measure metal teeth braces at much lower prices than you might expect. These teeth braces are suitable for both adult and children’s orthodontics. Here at Winning Smiles Orthodontic Clinic in Romford, Essex, we understand that many patients want their crooked teeth straightened but don’t want the higher costs of the invisible or removable teeth aligners. Winning Smiles started as an orthodontic practice, and since the very beginning, it has always been our ambition to be able to offer full teeth straightening with dental braces at an affordable price to everyone that needs it! There are many options with white brackets a potential for some. After the initial fitting, there will be short visits every six weeks or so to adjust the brackets as the teeth move into the desired position. Between 12 – 30 months, it varies according to the distance and the individual jaw. For this teeth braces option, you don’t have to be a member to take up treatment, although we have an excellent dental health plan that covers all hygiene and preventative maintenance for those that do choose to join. We will need to carry out a full clinical examination including orthodontic x-rays and taking impressions for a one-off fee of £195, and a deposit may be required. We always make sure that there are no unforeseen issues before we start. After the initial sum to get going, the monthly payment is made by standing order with zero interest! This is a stage payment to the clinic, although we can offer finance to those who request it. The eventual cost for the braces treatment will depend on how long the teeth take and how far they need to move in the circumstances. After the treatment, we will provide you with dental retainers that, as with all orthodontic treatment, need to be worn after the teeth are in place to keep the teeth in situ, it’s vital. The only other cost that might (very rarely) occur is if a CT Scan is needed, for an impacted tooth for example. All our discussions are with the patient in mind; we want you to be completely comfortable with all the available information to hand before you commit to anything. Terms and conditions do apply, we will go through everything with you. With teeth straightening, we provide many different treatments and so we hope there is something for everyone to go as quickly or slowly as they need. 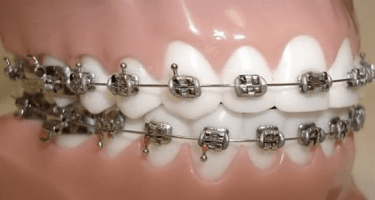 There seems to be much less of an issue in wearing fixed metal braces than there ever used to be, but if invisible braces are preferred, then we do have lingual options and Invisalign. For patients who only want to straighten the front teeth, we can use the Inman Aligner, Six Month Smile, Secret Smiles (lingual orthodontics) and Simpli5, or possibly instant composite veneers could be an alternative option for those who prefer an Instant Result! For more comprehensive treatments we use Damon Braces (rapid teeth straightening system using clear brackets), or Invisalign again. There are many different types of bite problems. Crowding, Spacing, Overbite, Openbite, Underbite, Crossbite, Overjet are only some examples of the common bite problems experienced. Fortunately, Winning Smiles Dental Braces can help you with most any bite issues. In quite mild cases, patients can consider instant veneers in which we build up teeth to counter slight crookedness and straighten the smile – or use a combination with braces too. Overcrowding of the teeth is one of the most common problems that require orthodontic treatment. There are plenty of factors that contribute to dental crowding. Most often, this is hereditary. However, it may also be there from birth, extra teeth, misshaped teeth, and misalignment of jaw fractures. Childhood habits such as thumb sucking, prolonged bottle use, and tongue thrusting can also cause dental crowding. Another common issue that needs orthodontic attention is spacing. We see this almost as much as crowding, this type of bite problem is caused by the size of the teeth and spaces in each jaw. In addition to Teeth Crowding and Spacing, Overbite is also a common dental problem. An overbite occurs when your upper teeth overlap your lower teeth. The cause can also be hereditary, or a malformed jaw. This type of dental problem is a lack of vertical overlap on your front teeth. Simply put, overbite occurs when your upper and lower front teeth do not touch when you bite down. It can be abnormal jaw growth, or something as simple as thumb sucking and tongue thrusting. If there’s an Overbite, you can expect that Underbite exists as well. An underbite is when your lower front teeth jut out in front of your upper front teeth. Also known as an anterior crossbite, it is caused by having a small lower jaw or a small upper jaw. There are also cases where it is a combination of two causes. A Crossbite is when your top teeth fit inside your bottom teeth, which can happen with your front teeth or your back teeth. Crossbites most often occur with a narrow upper jaw. Finally, we have the Overjet which happens when your upper teeth jut out in front of your lower teeth. It can be a larger top jaw or a smaller bottom jaw. Similar to Underbite, an Overjet can be due to a combination of both. Before finding the best solution to your Bite Problems. Perhaps we should mention what a proper bite form should be. An Ideal Front Bite has aligned teeth partnered with midlines and a slight overbite. The ideal side bite is when your teeth properly mesh together with a slight overbite. So, is it worth fixing your common bite problem? The simple answer is YES. Fixing your overbite problems can help with eating and speaking, reduce the risk of injuring your teeth, and it also makes you feel good and look good. Having great teeth does help you feel good, our reviews are full of happy sounding people. Aside from the smile improvement, fixing bite problems also helps provide better mouth hygiene, keeping your teeth straight and healthy, for some removing the discomfort some might be feeling when eating/speaking. Most importantly, working with us to fix your teeth can help you prevent further dental damage in the future. We look forward to bringing a smile to your face, (and will try and keep more cheesy dental gags to a minimum). Thanks for considering us.